There are two main camps for the spark timing of a dual plugged airhead engine. Both seem in rough agreement that timing should be retarded to about 28 degrees at maximum advance compared to the stock BMW timing specification of 32 degrees. This retardation of the spark (compared to the stock setting) is necessary because – to put it simply- the two flame fronts from two spark plugs get everything happening more smartly. The two camps may be roughly summarized as follows. For those who don’t want to fiddle with the innards of the mysterious timing canister or ‘bean can’* or install an aftermarket electronic ignition that caters for dual plugging, there is little choice but to retard the timing at idle from the BMW spec by said 4-6 degrees – close to TDC. This does not change the shape of the timing curve that the stock bean can delivers, but shifts it in its entirety by the same fixed amount across the entire rev range and causes the maximum advanced to be reduced to around 28 degrees. The ‘S’ mark on the fly wheel (or clutch carrier as the later, lightened items are called) is the stock timing mark at idle and is 6 degrees BTDC. The ‘OT’ mark represents TDC (zero degrees). So, to retard the stock timing by 4-6 degrees, people are timing their machines at idle so that the OT mark is at, or around the center of the timing viewing port. The stock maximum advance of approx. 32-33 degrees (depending on the model year) is designated by the ‘Z’ mark on the flywheel and occurs at around 3000 RPM with the stock bean can. The retardation that is introduced at idle also shifts the point of maximum advance by 4-6 degrees to appox 27-29 degrees. In which case, you and your strobe may just see the ‘Z’ mark hanging around the very bottom of the viewing port at engine speeds of 3000 RPM and above. A handy number to keep in mind is that one degree of crank angle corresponds to about 2mm along the periphery of the flywheel i.e. where the various timing marks are stamped. 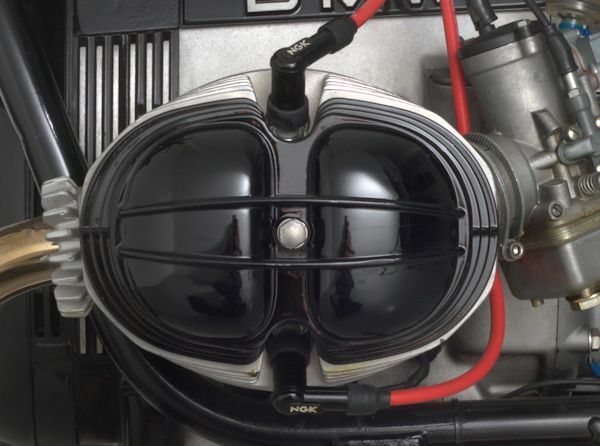 * In this article ‘bean can’ refers to the timing canister found in >1981 airhead motors. i.e. when electronic ignition was introduced. Not to be confused with the bean can found in models immediately proceeding 1981 which contained points style ignition. For those who are brave enough to mess about with the fiddly bits in the bean can, springs can be played with, bobwieght masses changed, and travels altered in order to change the shape of the original timing curve. An infinite array of curves can be achieved in this way. There is rough consensus within this camp that in addition to retarding the maximum advance by 4-6 degrees, dual plugged engines enjoy curves that are stretched compared to the stock curve so that maximum advance occures at higher engine speeds than stock. Some say 3500 RPM is ok, some say 6000 RPM! For this scenario, the timing at idle is generally set at around stock (the ‘S’ mark) and the range of advance that the bean can delivers is compressed by our 4-6 degrees in order that the timing at maximum advance is retarded by that same amount. I went about the business of modifying a bean can according to the vagaries of the 2nd camp as described above. Installed it in my bike and set the timing at idle to around stock. In this case, just a tad retarded on the stock figure at 5 degrees BTDC. With degree wheel and strobe, the curve of the modified can was mapped and graphed. The two camps are represented below. 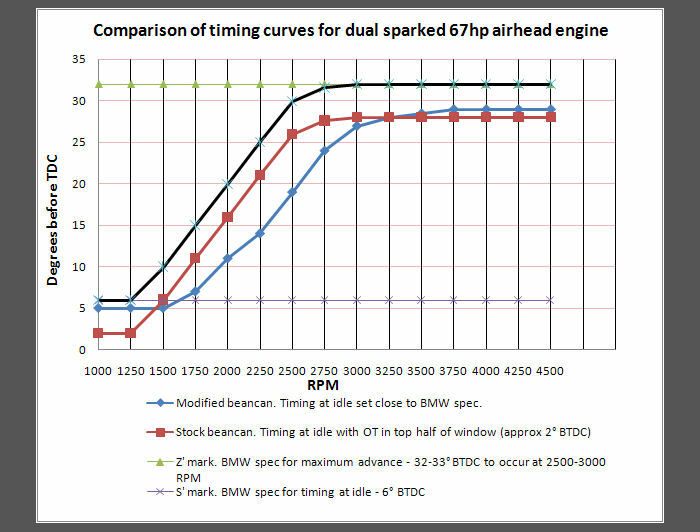 The black curve is the stock spark timing. The red curve is camp 1. and the blue is camp 2 – my modified bean can. Off to the dyno man I went to compare both camps. 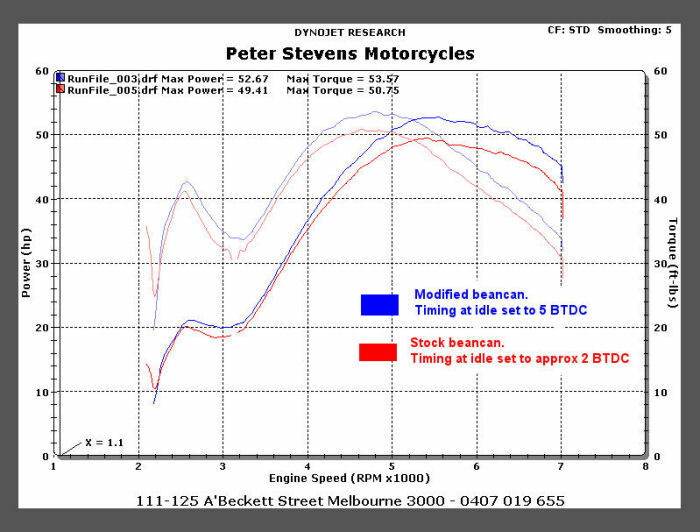 The dyno chart below is pretty ugly due to some tuning issues that were fixed up later, but what it clearly shows is that modifying the bean can – camp 2- improves performance almost over the entire rev range compared to using an un-modified with retarded advance – camp 1. So, yes, it is definitely worth modifying the bean can or installing an aftermarket electronic ignition that provides an ignition curve that is designed for dual plugged airheads – Silent Hektik, Dignition, and Omega are some of the better known brands. I find this article very interesting, showing proofs rather than guesswork. However, I wonder why there is a difference at higher RPMs (over 3000) as the ignition timing is more or less the same for stock and modified bean can. Any explanation for that? Yes can see that the timing graph can be a little misleading. The red line is the unmodified bean can but the timing is set to around the ‘OT’ (top dead centre) in an effort to reduce the maximum advance to 27-28* as required for dual plugging. If you modify the bean can, then you can leave static timing at the stock 6* and stretch the curve somewhat while attaining 28* max advance. That’s the blue curve. Thanks for your reply. I am fully Award of the different advance curves, but What I did not explain Well enough was the relation to the power curves. I wonder why there is a difference in the power curves of appr. 6 HP at eg 5500 RPM in favor of the modified bean can, when the ignition advance is equal to the retarded stock at that RPM. I expected there would only be a difference where the ignition timing is different. Good question! Yes, I agree: In principle there should not be such a difference in HP for similar timing at a particular RPM. Though there is a difference of a degree or 2 which would result in some HP variation but probably not 6HP as you point out. I did those tests many years ago. There was only one dyno pull for each case. Since then i have had far more experience using dyno’s and can say there are miriade reasons for variation between 2 dyno pulls without changing anything on the bike! Those tests would have been done differently if I’d done them today. Also, the measurement of spark timing with degree wheel and strobe is a little dicey as the reading tends to bounce around. Does the above render my conclusions in the article meaningless? Maybe!! At least your conclusions made me change from to camp 1 to camp 2. and I do not regret. I swapped the stock advance unit with an electronic advance unit (22 deg. at 3600 RPM + 4 deg advance at idle). Good to hear that camp 2 worked for you too – always good to receive confirmation of your own findings. Thanks for that!